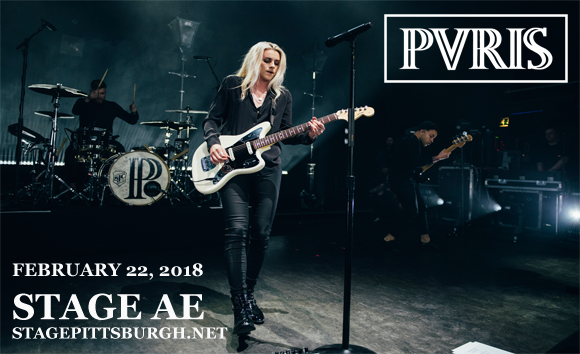 PVRIS are embarking on their hotly anticipated North American tour, following the release of their smash hit album All We Know of Heaven, All We Need of Hell! Heading to Stage AE on Thursday 22nd February 2018, the band's atmospheric, danceable electro-rock is nothing short of breathtaking live – it's going to be an unmissable show! Hailing from Massachusetts, American electro-rock band PVRIS was formed in 2012 by members Lynn Gunn, Alex Babinski, and Brian MacDonald. The band originally had five members and went under the name Operation Guillotine. Their self-titled debut EP, PVRIS, was released in 2013, leading the band to sign with Rise and Velocity Records the next year. The band have since released two studio albums with the label: White Noise (2014), and their mos recent release, All We Know of Heaven, All We Need of Hell (2017).